↑ Translation used by Birkbeck. "Centre for Learning and Professional Development – Communication Skills". Birkbeck, University of London. Retrieved 2007-08-05. ↑ "2015/16 Students by HE provider, level, mode and domicile" (XLSX). Education Statistics Agency. Retrieved 17 February 2017. ↑ "Degree-awarding powers". www.bbk.ac.uk/. Birkbeck, University of London. Retrieved 9 September 2015. 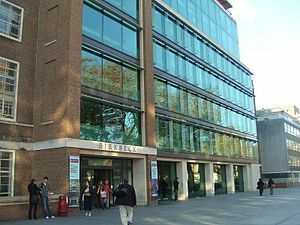 ↑ "Birkbeck recognised as a "global elite" university and shortlisted for University of the Year". Cambridge Education Group, The Global Education Specialists. Retrieved 30 September 2010. ↑ "The History of Birkbeck". Birkbeck, University of London. Archived from the original on 2006-10-06. Retrieved 2006-11-26. ↑ Birkbeck, University of London Continuing Education Courses 2002 Entry. Birkbeck External Relations Department. 2002. p. 5. ↑ "Birkbeck projects win £8.7m HEFCE funding for innovative higher education provision in London". Birkbeck, University of London. Archived from the original on June 27, 2006. Retrieved 2006-11-26. ↑ Birkbeck, University of London Continuing Education Courses 2004 Entry. Birkbeck External Relations Department. 2004. p. 4.